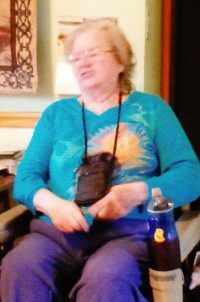 Ethel J. Houghtaling – 77 – of 5175 Route 436, Dansville, NY died Monday morning (March 18, 2019) at St. James Mercy Hospital, following a brief illness. Born in Austinburg, PA on May 18, 1941, she was the daughter of Wilson & Florence (Giles) Potter. Ethel grew up in the Hornell – Canisteo area and attended Canisteo Central School. At the age of 17, she married Merle E. Houghtaling. Throughout the years, Ethel & Merle resided in several locations, primarily in the New York State / Pennsylvania areas. She had been employed for a time as a forklift operator at the former A&P Plant in Horseheads and later served as a driver & circulation manager at the Hornell Evening Tribune. More recently, Ethel was employed as a certified Nursing Assistant (CAN) at the Livingston County Center for Nursing & Rehabilitation in Mt. Morris, NY. Ethel enjoyed crocheting and throughout the years made beautiful Afghans which she gave to family members. She also enjoyed playing video games on the computer & play station. However, her greatest enjoyment in life was simply spending time with her family. She was preceded in death by her husband, Merle E. Houghtaling who died October 8, 2006; her son, Kevin Houghtaling; her daughter, Dawn Marie Houghtaling; her brother, Dwayne Potter; her sister, Barbara Potter. Surviving are 3 sons, Brian (Carol) Houghtaling of Wellsboro, PA, Richard (Sherri) Houghtaling of East Stroudsburg, PA and Mike (Penny) Houghtaling of Arkport, NY; 1 daughter, Robin (Mark) Newcomb of Dansville; 3 brothers, Harold Potter of Elkland, PA, John (Connie) Potter of Florida and Rocky Potter of Florida; 2 sisters, Eleanor (Alfred) Tombs of Harrison Valley, PA and Belva (Danny) Wilcox of Elmira, NY; 12 grandchildren; 16 great-grandchildren; 1 great-great-grandson; several nieces & nephews. The family of Ethel J. Houghtaling will receive friends on Saturday from 1:00 PM – 3:00 PM at the Dagon Funeral Home, 38 Church St., Hornell, NY. Funeral & committal services will be held at the conclusion of calling hours at 3:00 PM with Deacon Robert McCormick officiating. Burial will be in Greenwood Cemetery, Greenwood, NY. Ethel’s family request that in lieu of flowers, memorial contributions in her name be made to St. Jude Children’s Hospital, St. Jude Children’s Hospital, PO Box 1000, (Department 300), Memphis, TN 38148. Memorial forms will be available at the Dagon Funeral Home.